2011 Bull Mountain, GA Track. STATS - Length= 14 inches - Width (Ball)=4.75 inches - Width (Heel)= 3.25 inches - Stride = 7 foot - Depth = 0.5 inches. At first, Jeff thought that somebody was playing a trick on him. Laughing, he took a couple photographs of the footprints with his cell phone. He started following the prints to see where they led. The more Jeff saw of them, the more he considered that they were not left for his discovery. After all, he had not seen anyone else that day in the area, and this location was chosen for its distinct lack of visitors. Also of note is that the daytime temperatures that day hovered in the low 30's until mid-afternoon. Whoever left these prints was clearly barefoot. Upon looking closer at these prints, Jeff noticed what he described as “fingerprints” in them. More commonly known as dermatoglyphics, these minute skin details are only found on primates. They are used to increase friction on our hands and feet for brachiation and grasping objects. This observation also negates the possibility of the impressions being left by a person wearing Vibram footwear. The excellent condition in which the prints were found indicated to Jeff's experienced eye that they were within minutes to perhaps a couple hours old. Though the photographs have no scale item, Jeff noted that he could fit his entire boot on the inside of the prints without overlapping the edges. When I had the chance to later measure Jeff's boots, their size indicates that the footprints were somewhere in the vicinity of 13.5 to 14 inches long. We would later recreate the step and stride lengths to find that the left and right prints were spaced about three-and-a-half feet apart (this is the “step length”), giving a stride length of seven feet or so. 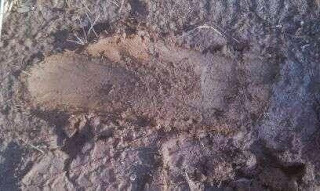 The length and stride measurements for this print are estimates given by the witness during the on site investigation using his boot as a scale item. The width measurements were derived by using simple ratios, and are based on a 14 inch length. Again very sorry, I do not know who to credit for this photo and original report. It is very much worth sharing.